Ok, so its time to move away from blue after this card. I had these two labels left after I was playing the other day, so I decided to jazz them up and use them today. After building the center accent piece and adding it to the blue top fold card base, I decided that butterflies would look nice going down the center. So, heading to my punches and dies I decided to use the Sizzix Movers and Shapers butterfly, it was the perfect size because I wanted to use three down the center. Using 2 butterflies and layering one on the other, I used the Tim Holtz tiny tacker to join at the center, then added the bling over the staple. 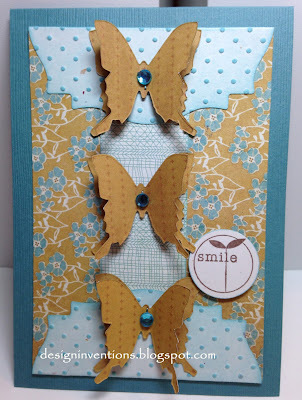 I only adhered the bottom butterfly to the card and then popped the wings of the top butterfly. Adding the simple stamped and punched circle sentiment and we're done. As you can see I've been playing with quite a few different things this week. I have a problem with throwing scrap papers away so I tend to make many cards out of odd little pieces of paper. Then I find that my cards start to look alike, or at least the same colors. Then I shift to something else and start the process over. So this card is using up things and adding a few other new ideas. I have the basic flower layering with a brad in the center. 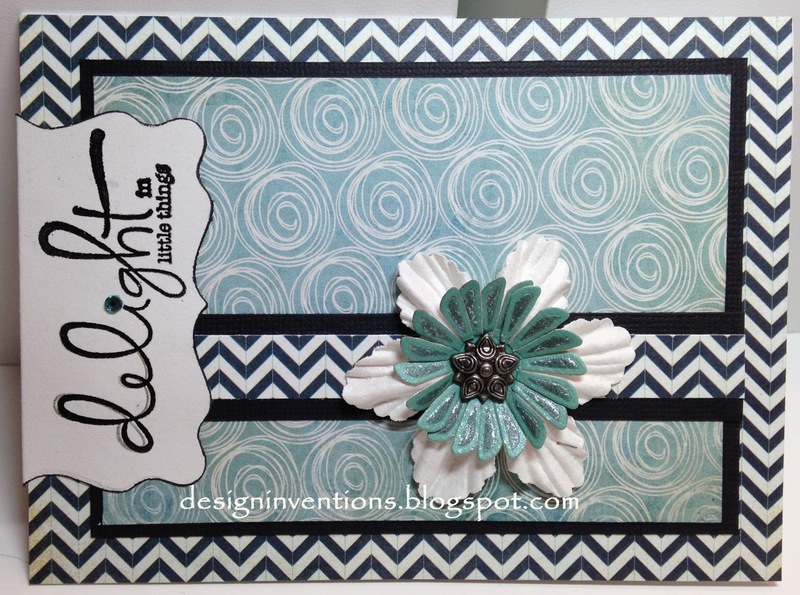 Adding a paper stripe then a sentiment folded label finishes this card. This card was so much fun to create. I have two tools that I am now in Love with. First is the Circle Scissor Pro (page 137 of amuse studio catalog) and the EK Success ZigZag punch. I pulled this circle pattern paper from my stash and it was just screaming to add more circle accents. With the Circle Scissor Pro you can cut many sizes of circles and rings as thin as 1/8 inch. 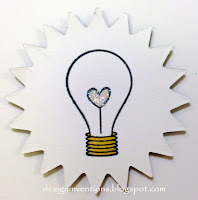 I have trouble with my hands, so many tools are very difficult to use but this circle cutter is easy breezy. After punching a few extra hearts I couldn't let them go to waste, so I punched the white ZigZag piece and placed it at the bottom on the inside of the card. Then I attached the extra hearts. 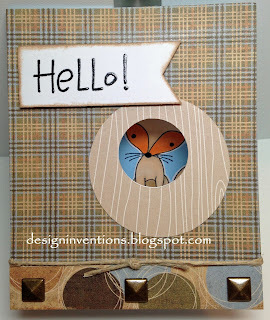 This little card is just for fun...I see this little Hero Arts Fox stamp sitting on my stamp wall and he always make me smile. I was playing with the Circle Scissor Pro and making some circles and decided to use them and make this fun card. The little fox is peering out of his foxhole to say "Hello". 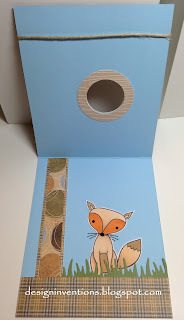 I added a little grass from a border punch, accent papers and colored the fox with Copic markers. Hope you enjoy and have a fun Saturday. I have a couple of things to share with this post today. 1. I used the Amuse Studio Fishtail Pennant Die to make this top fold card, hopefully I can get a video together that shows you how to place your die on the paper and make a card like this. 2. I used paper flowers and Copic Markers to make the accent. I have 3 layers and started with darker R's on the bottom and worked back up to the lighter YR's. 3. 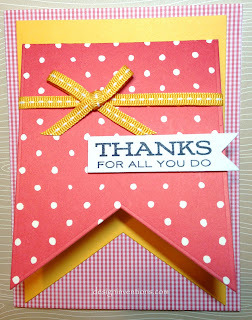 Scrap paper for accent, bakers twine and a fun sentiment banner finish this card. Hello again from SUNNY Iowa. We finally have some wonderful weather and signs of spring are here. I have another C.C. Designs image to share today. I colored with my Copics and layered using several scrap papers. I love these little faces and the big grins, and of course she has glitter on her wings. I wanted to color today because I haven't been picking up my Copic Markers lately. Cleaning up around my desk area I found these stamps from C.C. Designs that I really didn't use during the Easter season. 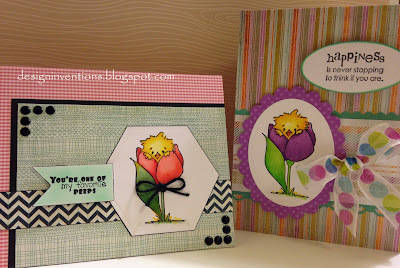 I love these little peep faces and they really work for spring. I colored the image 2 different ways and worked up a couple of cards. I've been seeing the chalkboard cards and supplies showing up everywhere lately, so while I was at Staples this morning, I picked up a couple of labels in the Martha Stewart area. There were several style to pick from, but I decided on this shape with the ticket stub corners. It's big enough to cut down if I want, but today I choose to use the entire label on this card. 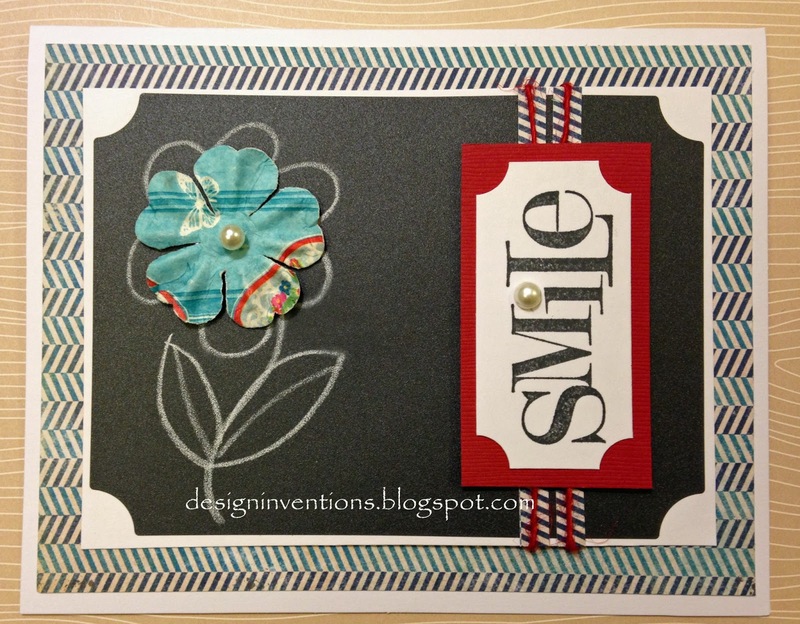 I have a couple of paper layers on the card front then adhered my chalkboard label. Drawing on the chalkboard can be a little tricky so maybe planning out what you want before actually placing your chalk down would be a good idea. ( I am NO artist). 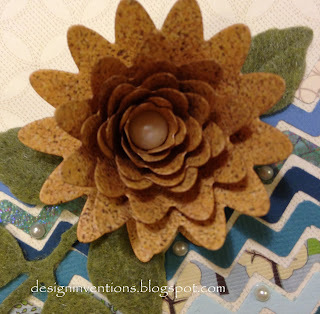 I have a basic flower and then put a decorative paper flower in the center, added the vertical sentiment and I have a simple all occasion card. A special gift for you the month of May. In May, Amuse Studio is offering a gift with purchase that all customers can take advantage of! With every purchase of $35 or more,(in a workshop or an online order) you will receive a pack of Onyx notecards for free. These stylish notecards make it easy to get that "chalkboard" look everyone's talking about. The fine print: One gift with purchase per order. Gift will automatically ship with order. $35 qualifying purchase is before tax and shipping. You will receive eight A2 notecards per pack. 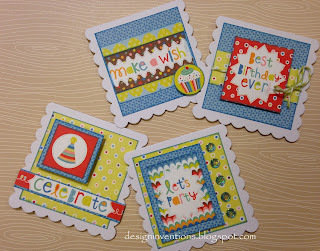 For those Hostesses in May, you can earn an exclusive Hostess stamp set - Eat Cake - by simply having a qualifying workshop. The fine print: A qualifying workshop is at least $150 before tax and shipping and has four unique customers. The customer count can include the Hostess. Stamp set will automatically ship with workshop order. The stamp set is a $24.99 retail value. If you have any questions please email or call me. You can place a customer order by going here. Spending Sunday in my craftroom, watching Nascar,(yes I'm a fan) going through my scrap bins and making a few cards. This card was so,so, much fun. 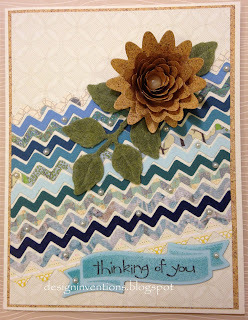 I used the new EK Success zigzag border punch and just made a bunch of zigzag pieces. Keeping them in the same color family, I adhered them to a piece of paper, then layered on the card front. I pulled out a few Spellbinders dies to make the flower, leaves and sentiment banner. Placed a few pearls as an accent and used my airbrush with BG18 to add some color on the banner. 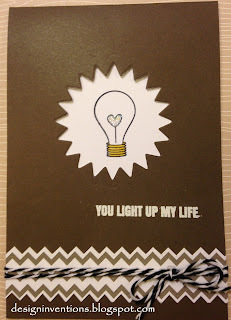 You can use any sentiment, but this one is from Stampin' UP! I hope this challenges you to use some of those scraps instead of throwing them away. Some of my best work comes from things just laying around on my desk. 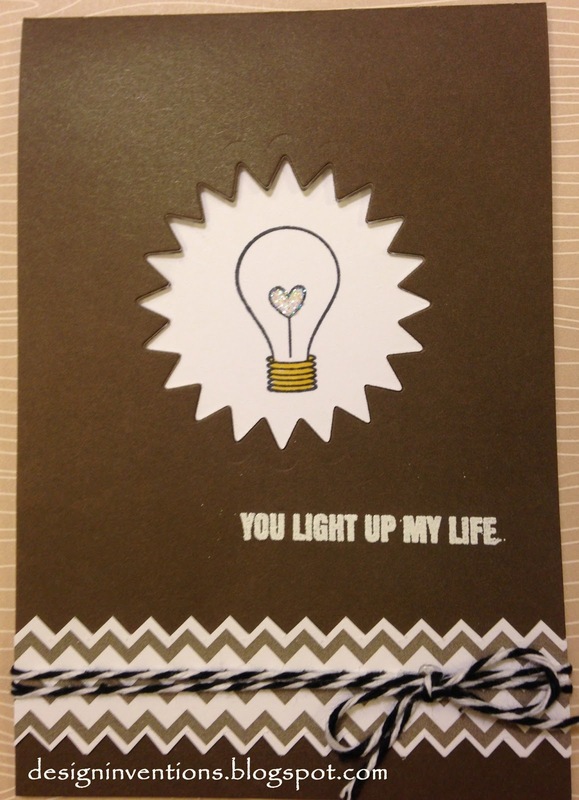 This was a card that I made for my Husband. 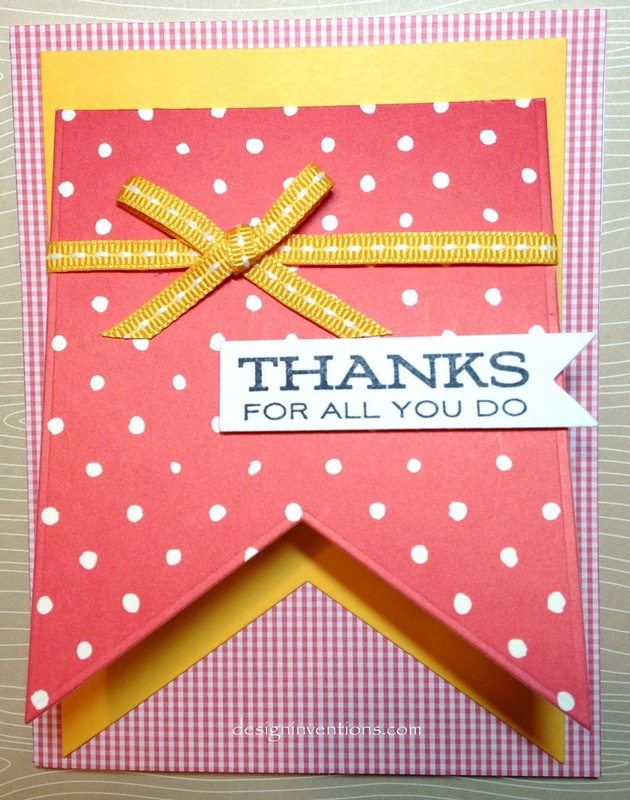 Simple top fold card that I will make again because you can add so many different sentiments. I just LOVE Owls. I really don't know why, but they are so big this year and they make me smile. 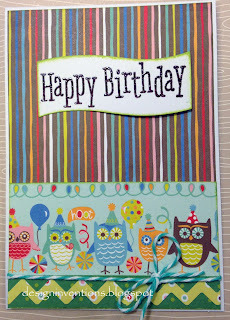 I used the My Minds Eye -Hootenanny 6 X 6 paper pad, banner die from the Sizzix Banner #2 collections, Sentiment from Hero Arts - CL661, EK Success punch - zigzag and twine. Enjoy and have a good day, it's finally sunny here in Iowa! 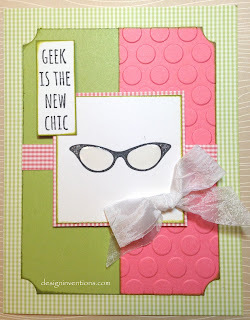 Today I am sharing one of my favorite types of cards. I Love to make mini cards and they are so easy. 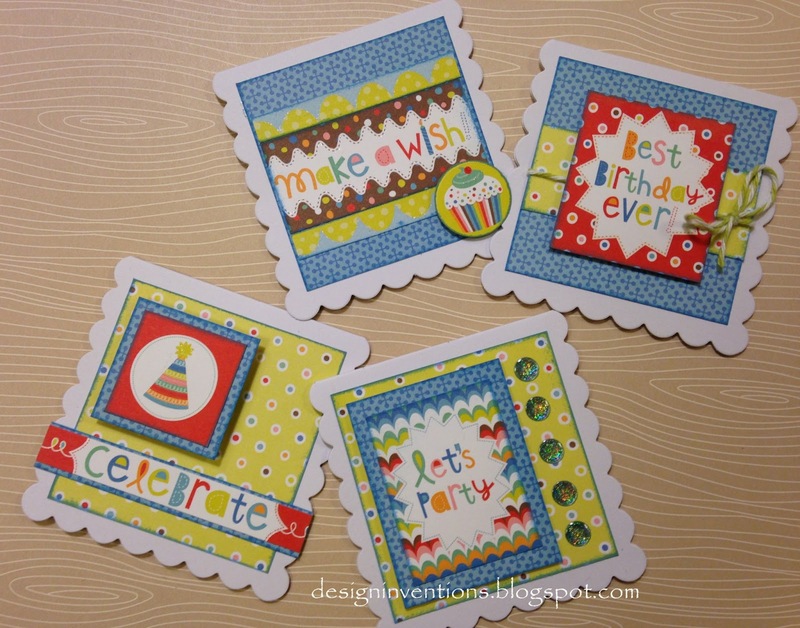 Small 3 X 3 cards are a must have in your collection because you can use them for a quick card on a present, you can place the small card on a larger card front and or you can make 4 to 6 and give as a present to a special friend. I added twine, glitter pen, gems and pop-dots. Simple card today. 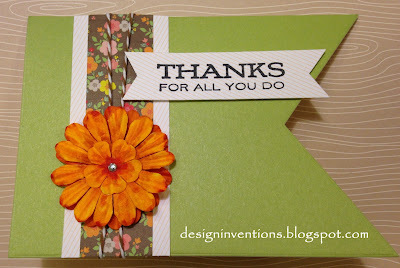 I stamped he flower image in several colors on the card, stamped a sentiment, added twine and a small gem. 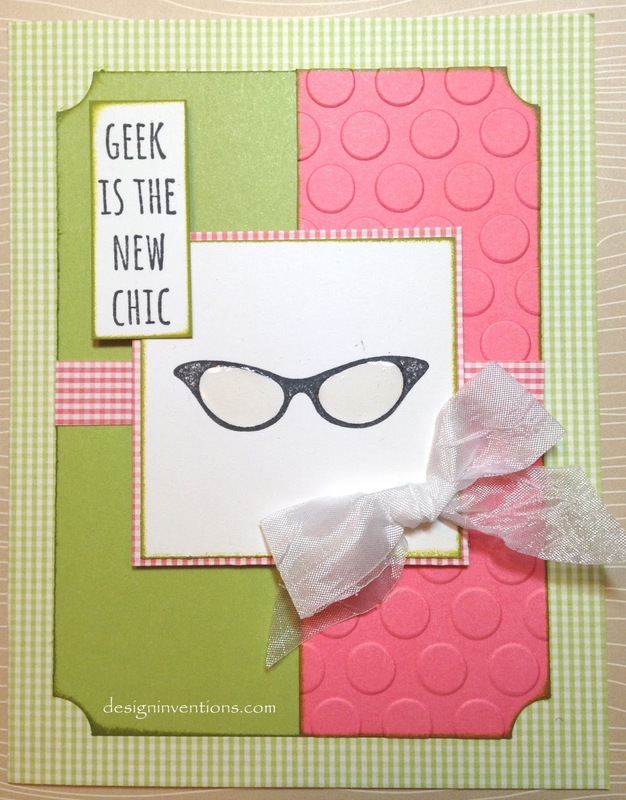 Playing again with some of the new a•muse │studio inventory that I have, this card has a fun pair of glasses that remind me of my mother. This style and profile was exactly what she wore while I was growing up, so it's a fond memory. 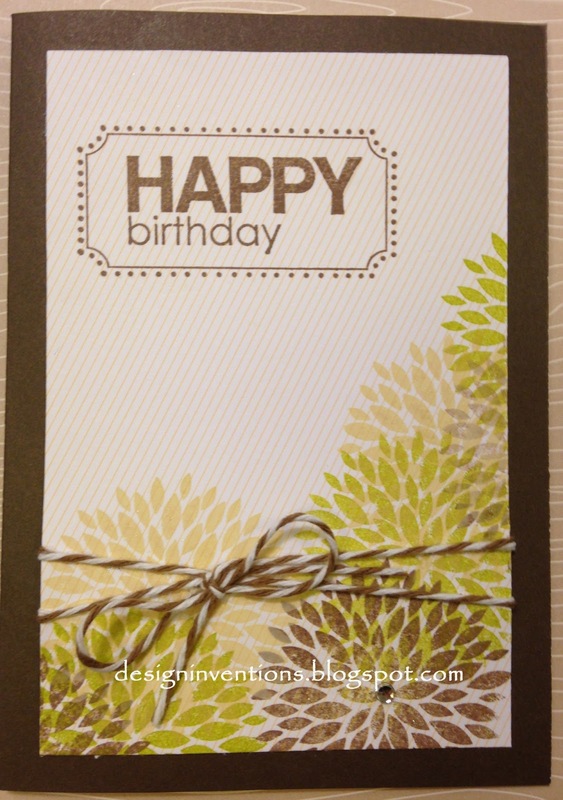 A few papers, embossing folder, Glossy Accents and of course some ribbon were used to complete this card. So, today we have MEGA RAIN here in Eastern Iowa. We are under a flood watch in many areas and thunder storms abound. What's more fitting than a card about rain? A very simple card using various scrap paper with the base being made from the a•muse │studio Petite Pinstripe cardstock. 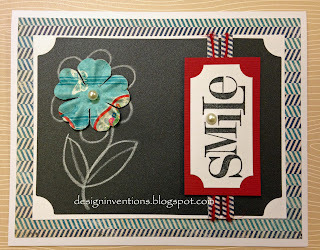 I used a Martha Stewart punch to add a little fun on the edge of check paper at the bottom of card. 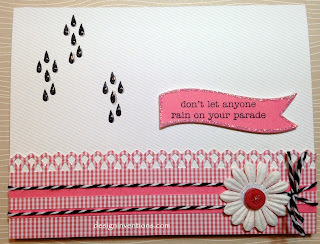 The raindrop and sentiment images can be found in the stamp set - silver lining (SNSM079 )a•muse │studio. 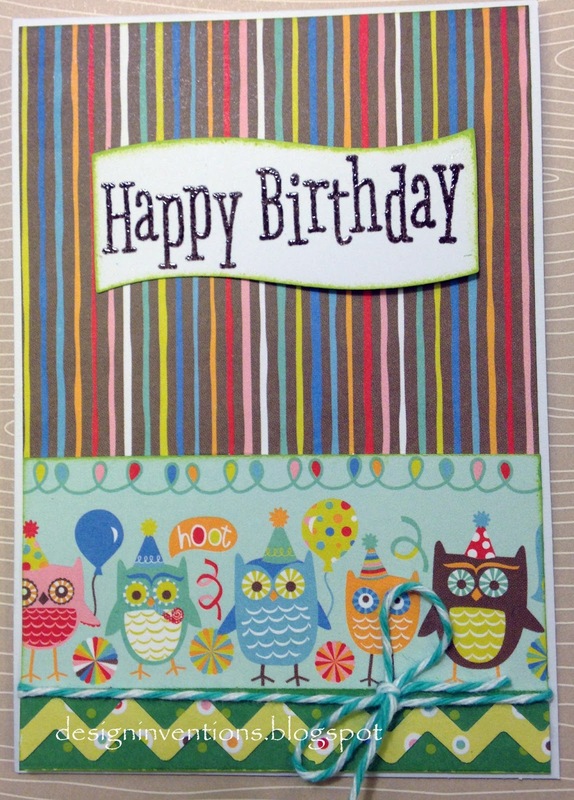 The pennant shape is from cake topper die set (TAD0029). a•muse │studio Glossy Accents on the raindrops, glitter on the banner, a paper flower, button and twine finish off the card. I know we need the rain, but I hope everyone is staying dry. Sorry for being MIA lately, but I've been busy helping to prepare for a special little one that is expected to arrive in about 6 weeks. I've been sewing, painting and upholstering a chair. I attended one baby shower and have one more to go. Needless to say I'm excited and can't wait for his arrival, (probably not as anxious as his mother and father). I'm excited to say that I've started a new venture/business. I recently became a Creative Consultant for a•muse │studio. 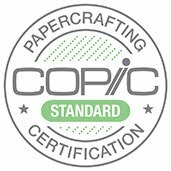 Many of you know I've been struggling with the products that are available here in Cedar Rapids, so I decided to join an organization that offers quality paper, stamps, ink and many other accessories and tools. I've been using their products for a couple of years and decided now was the time. I am working on a few card samples as my inventory of products arrive so that I can conduct some workshops and invite everyone to come play with me. I have attached my web page with a•muse │studio here. Go browse and see what we have to offer and feel free to contact me if you have any questions. You may also order directly from my website page if you'd like. I will be sending an email and also posting here on my blog when I have my first workshop ready. Please contact me via email if you are interested in updates so I can be sure not to miss anyone. 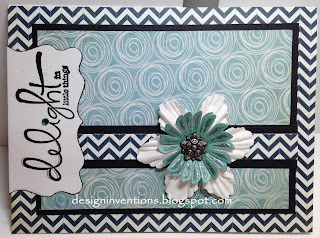 Here is a card that I have put together using the fishtail pennant die and a die from the cupcake topper set. 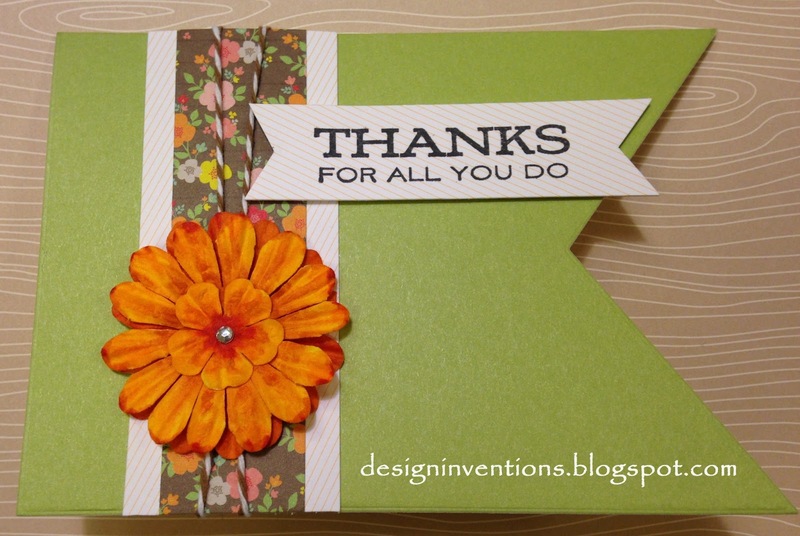 The sentiment is from the tool-rific (SISS015) stamp set. which unfortunately a few are now disc, but fear not, there are many more to choose from.